edit on 28-3-2019 by ElectricUniverse because: add comment and link. Riiiight. ALL media is saying the same thing all over the world, did you ever think it might be truth? It will be a cold day in hell before that happens, facts aren't facts in todays right wing views. ROFLMAO... Look in a mirror to find the naive group whom to this day believe the "fake left-wing mainstream media." BTW, i am still waiting for any of you to prove how those policies implemented by the nazis are "right-wing..." Or what deluded mind can think that "the People's Republic of China is right-wing..." "CLAIMS don't make anyone right..." You have to prove your claim is right with evidence such as how any of the policies that the nazis implemented, and can be found in this thread, are "right-wing..."
For their part, businesses welcomed the Nazis' promises to suppress the left. On 20 February 1933, Hitler and Goering met with a large group of industrialists when Hitler declared that democracy and business were incompatible and that the workers needed to be dragged away from socialism. He promised bold action to protect their businesses and property from communism. The industrialists - including leading figures from I.G. Farben, Hoesch, Krupp, Siemens, Allianz and other senior mining and manufacturing groups - then contributed more than two million Reichsmarks to the Nazi election fund, with Goering tellingly suggesting that this would probably be the last election for a hundred years. Business leadership happily jettisoned democracy to rid Germany of socialism and to smash organised labour. For all the Nazi talk of "four-year plans" and the "guidance of the state," the sanctity of private property and freedom of contract was always preserved under the Nazis, even during the war years. Socialism - in particular, Bolshevism - on the other hand, were pernicious, "Jewish" imports that threatened the vitality of the German Volk. Trade unions had been in Hitler's sights since a general strike paralysed a right-wing-coup (Kapp Putsch) in 1920. He had witnessed the striking workers and vowed that never again would organised labour prevent the right coming to power. It was the left (trade unions and Jews), after all, that he and others on the right thought had "stabbed" the nation in the back on the home-front to cause the loss of the First World War. By early May 1933, the trade unions had been destroyed. German socialism was in tatters. I think the issue here is that you are defining right wing as liberalism. There is right wing liberalism and left wing liberalism, right wing authoritarianism and left wing authoritarianism. The difference is in who they represent. Think class structure. Marx was all about class structure. Hitler was attempting to crush organised labour movements (collective trade movements are a classic hallmark of the left) in order to protect the interests of the industrialists (owners of the means of production - a classic right wing mindset). It's not the intervention in economics that defines Right vs Left its the workers vs the owners. (even then that's only looking at one aspect of it, its complex). Many of the companies listed in the quote above that supported hitler are major global corporations to this day. There are other social issues, equality for instance (a true leftists would view a Jew or an African as just as much a "Comrade" as anyone else. As long as they were of the same class lol Marx was classist instead or racist lol). There are so many reasons Nazi Germany is considered a Hard Right Fascist state by pretty much anyone with serious credibility on the matter that it is ridiculous. You are saying the ATS community consists of all “Far Right” ideologies? If that’s the case, how do you have meaningful conversation if you all describe to the exact same ideology? What’s the point? Also does that mean no other political stances are allowed in this community? I thought this was a community for conspiracy theorists? Eugenics/The belief that it is okay to murder the unborn and it's more humane to murder them because they could be born with a disability or a genetic disorder, is not a right-wing belief. Nationalization of all infrastructure completely under the control of the state, socialized medicine, 100% government paid medicine, 100% education paid by the government, confiscation of lands and property for the good of the collective/common good/public welfare are not a right-wing belief or policy. The implementation of gun registration, and then the use of gun registration to confiscate the firearms of minorities, and political opponents, and disarming nations that were invaded by the "National Socialists" are not "right-wing policies/belief. Nationalism has been shown, several times, to also exist to this day in left-wing/socialist countries... Only in the "liberal/democrat/left" revisionism of history does the "left" believes that nationalism is only a "right-wing belief/system." 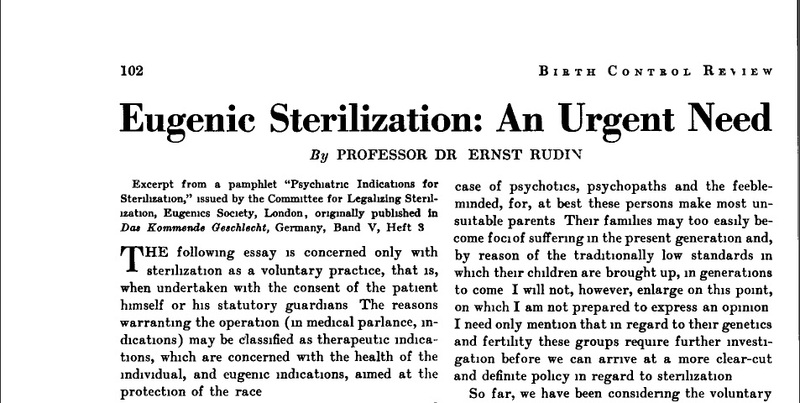 In 1933 she published an article written by none other than Dr. Ernst Rudin. Ernst Rüdin (April 19, 1874 in St. Gallen – October 22, 1952) was a Swiss-born German psychiatrist, geneticist, eugenicist and Nazi. Rising to prominence under Emil Kraepelin and assuming his directorship at what is now called the Max Planck Institute of Psychiatry in Munich, he has long been scientifically honoured and cited internationally as the pioneer of psychiatric inheritance studies. He also argued for, designed, justified and funded the mass sterilization and clinical killing of adults and children. edit on 28-3-2019 by ElectricUniverse because: add excerpt and comment. Explain how the crushing of organised labour to protect the interests of wealthy industrialists is left wing? That is the exact opposite of the very ethos of left wing. Or is that little historical inconvenience a lie in your eyes? The only people in the world currently trying to claim that the Nazi's were Left Wing are the Alt-right movement. Every socialist/communist regime ALWAYS shut down unions, or took them over and changed those in charge, that were founded under capitalism. Why do I have to keep repeating these facts? In this thread I have shown how other socialists/communists did the same thing Hitler did... The nazis/hitler implemented a state sanctioned union that took care of the workers. That's what ALL socialist/communist regimes have done, including Venezuela. In Venezuela, socialist President Hugo Chavez frequently touts his country as a workers' paradise, where workers run nationalized companies and the oligarchs are kept in check. But Venezuela is among the world's most dangerous countries for union organizers. Trade union activists are being murdered at an alarming rate -- 75 in the past two years -- as new unions vie with traditional unions for power and control. Some union chiefs say government meddling in the unions is stirring the violence. Chavez’s legacy has led to the creation of its own unions. One of the main organizations of workers loyal to Chavez in Venezuela is the National Union of Workers of Venezuela. This workers’ organization operates more like a political branch of workers who support the regime rather than as an association preserving worker rights. edit on 28-3-2019 by ElectricUniverse because: correct comment. edit on 28-3-2019 by ElectricUniverse because: add link and excerpt.